Sharing Treasures with my new recruts. Little pirate got the drop on me! 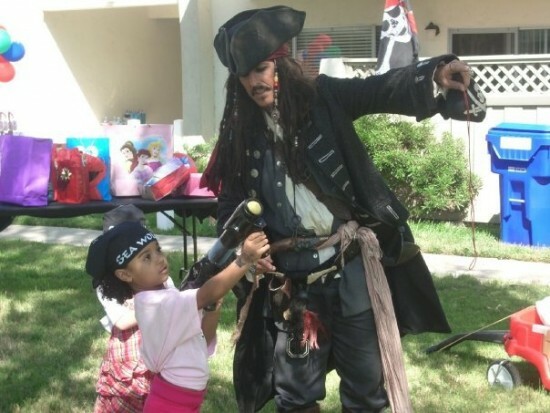 Southern California's number one Captain Jack impersonator specializing in parties for ages 1-70! Corporate events. Children's events. Master of Ceremonies. Birthdays, festivals, or any reason to "hoist the Jolly Roger! He was very engaging and entertaining for my 4 yr old son’s birthday party. He had many games and stayed in character the whole time. I would highly recommend. Witty, funny, and great with the kids! They loved all the games and prizes he had and will always remember their Pirate Party! Captain Jack made our son's party a smashing success! I could not have wished it to go any better, and our son told me that night as I put him to bed that it was the greatest day ever for him! Mission accomplished! Every kid was fully engaged in the activities the whole time, and LOVED him! me what a fabulous time (they!) and their kids had at the party because of him! 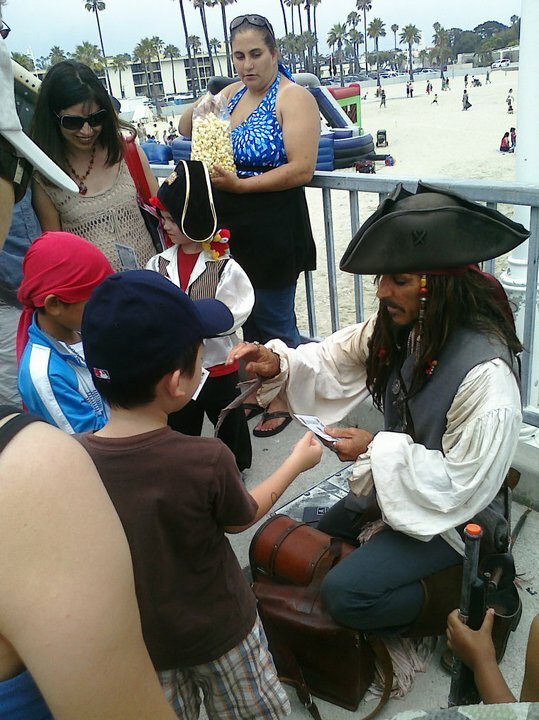 They all were mesmerized by Captain Jack and the activities were perfect for kids! He takes care of it all-games, trinkets etc! We were the envy of all other parties at that park that day--we had kids from other parties wandering over to be a part of the fun! I can hardly wait to plan something else "pirate-y" so we can see the OC Party Pirate again! Vince is absolutely fantastic at what he does! Thanks Captain Jack! Absolutely entertaining. Parents and children alike had a great time. We would recommendCapt'n Jack/O C Party Pirate to anyone. Can't wait until our next event. We look forward to seeing Capt'n Jack at other venues. AWESOME!!!! The BEST Captain Jack for any party. OC Party Pirate is the BEST Captain Jack for any event where there be children. I've seen him work with up to 150 children at one time. He makes sure every child has a smile from ear to ear from the time he arrives to the time he leaves. Once you've met him, you WILL love him too. Let Captain Jack run your pirate recruits through the tests he'll bring with him, along with the treasure rewards he shares with all his pirate crew! All games "ARR" indoor and outdoor friendly! 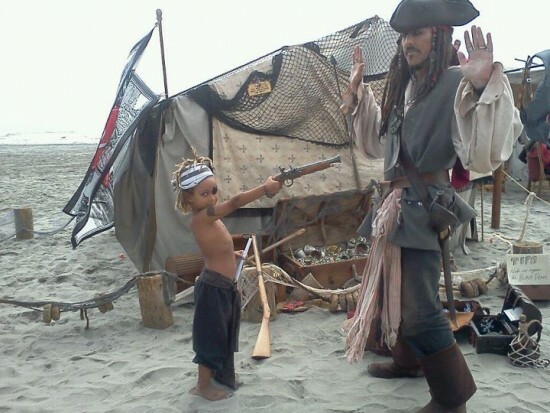 With "G" rated games for the kids like, shooting a hand cannon, walking a plank sword fighting, passing a bomb, loading treasure or just hunting for treasure during the "Treasure Hunt", Captain Jack will have all your crew talking about your party or event for months and years to come. 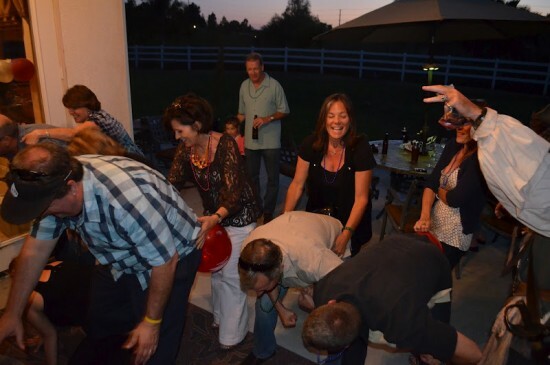 For adult themed parties, Captain Jack has "ARR" rated games like, pass the sword , pack the cannon and tip the wench that will leave your guests faces and sides hurting from laughing so hard. So, if your in the market, as it were, then send off a "message in a bottle" to me. I'll keep a sharp eye out. SORRY, NO "X" rated parties. I be a good pirate "SAVVY!" Smiles and laughter "ARR" required! Contact me with your Pirate party details.